While I love travelling abroad for a couple of weeks in the sun, I also enjoying nothing more than experiencing the beautiful country that I live in. Holidays in Britain are seriously underrated. Outside of London, I often feel that there are few places that get a look in and really, that’s not fair. We’ve got some of the best beaches, the most gorgeous rolling hills, beautiful villages and happening cities right on our doorstep and I want to travel and experience them all. My husband and I often venture out into the countryside for days out and we love to find new places to stay for a night away or two. 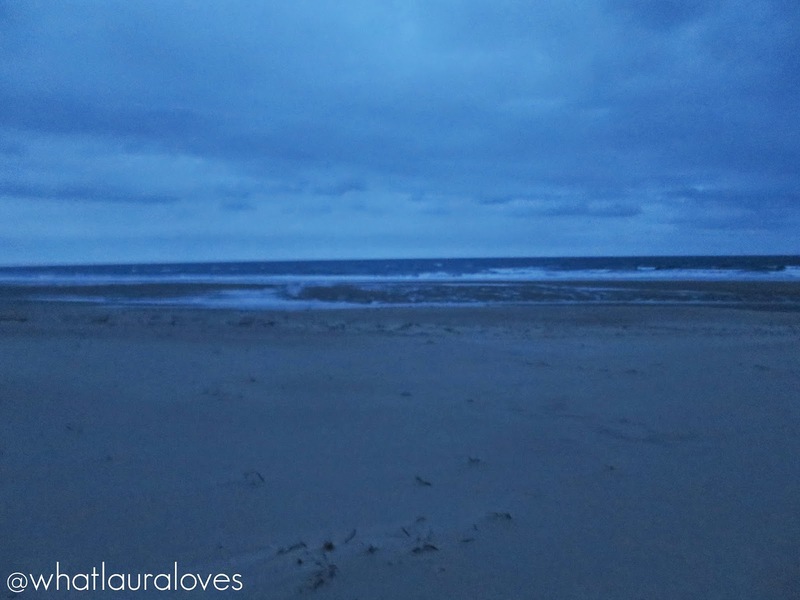 Our most recent jaunt took us up to the beautiful Druridge Bay on the stunning Northumbrian coast. 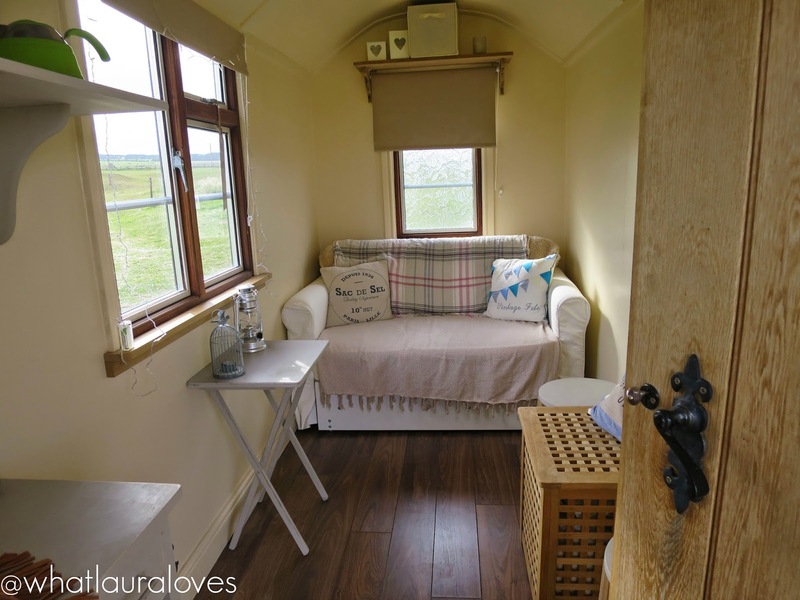 We were invited to stay the night in the Shepherds Hut at the Bells of Hemscott which is a wild glamping site situated just north of Cresswell, near to the market towns of Alnwick, Amble and Morpeth. 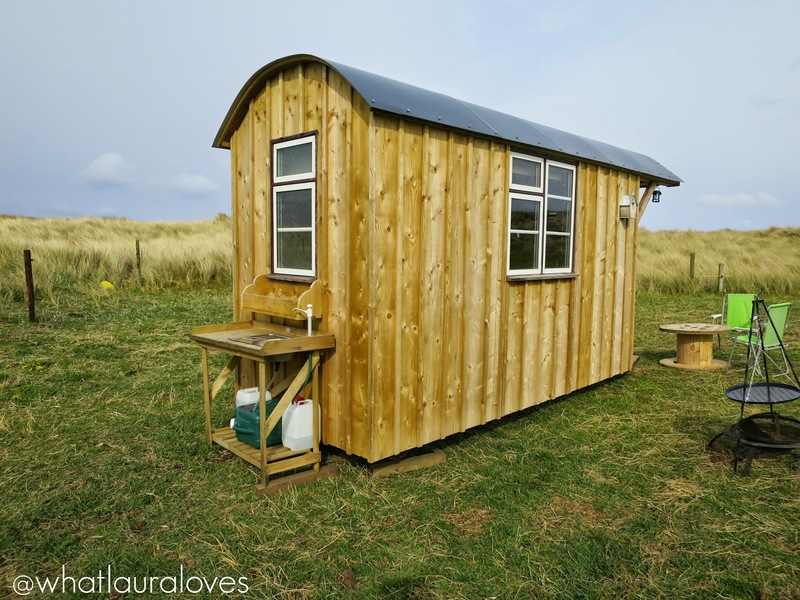 The Shepherds Hut is new to the site for 2015 and new to us too. 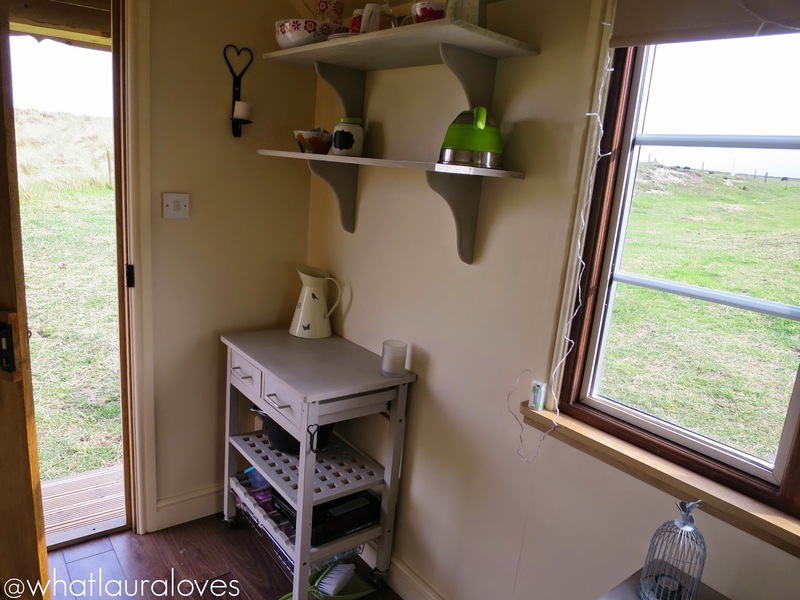 I’ve been camping before and I’ve stayed in many caravans and camping pods in the past but this was my first time staying in a Shepherds Hut and before checking out the website, I didn’t really know what to expect. There is a variety of different accommodation options at the Bells of Hemscott from a luxury cottage to bell tents and the Shepherds Hut. The latter of which sleeps two adults, making it perfect for a romantic getaway in Northumberland. 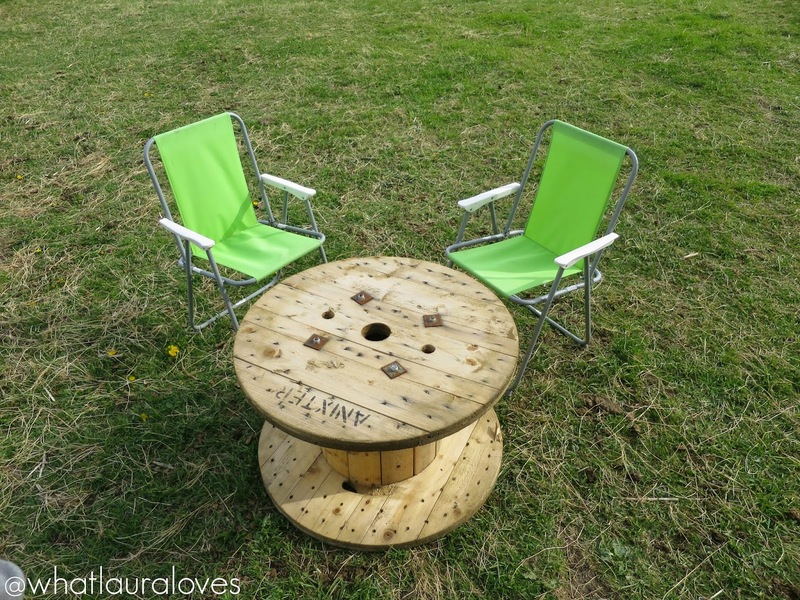 It is a great option for those who have never camped or truly experienced the outdoors before, or for those who prefer their home comforts but still want to experience a night away glamping. Bookings can be made online and it is really easy to see the calendar of availability and the cost per night for each type of accommodation. I found the site itself to be really easy to navigate and filled with useful information about the site and the facilities as well as the surrounding area which I think would be particularly handy if you were staying for longer than one night. The Bells of Hemscott offers their wild glamping experience on weekends between May and August and it was one Saturday at the beginning of May that we enjoyed our stay. The weather was certainly not on our side but I managed to snap quite a few photos before the weather turned so I do hope that these give you a good representation of what to expect. 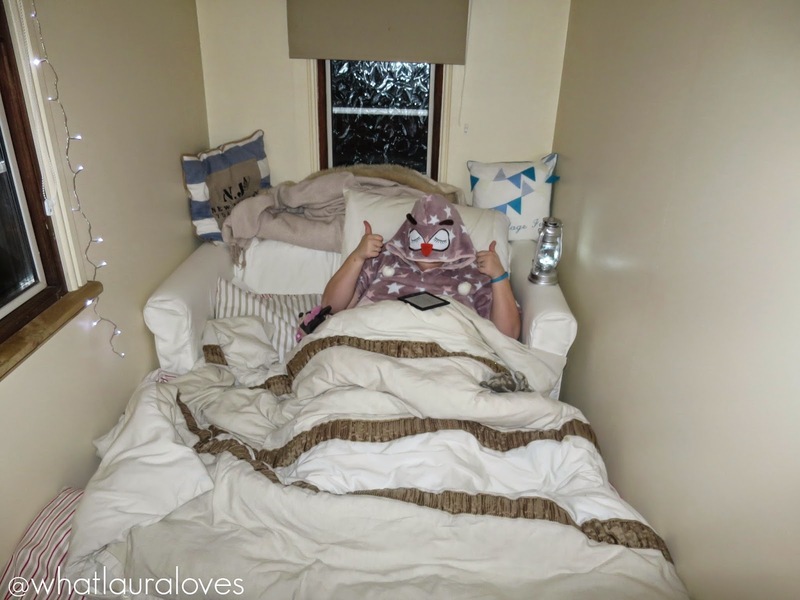 We loaded up our car with an extra duvet, my special pillow for my neck, a bottle of cava and lots of warm clothes before we started out easy drive up to the glamping site. 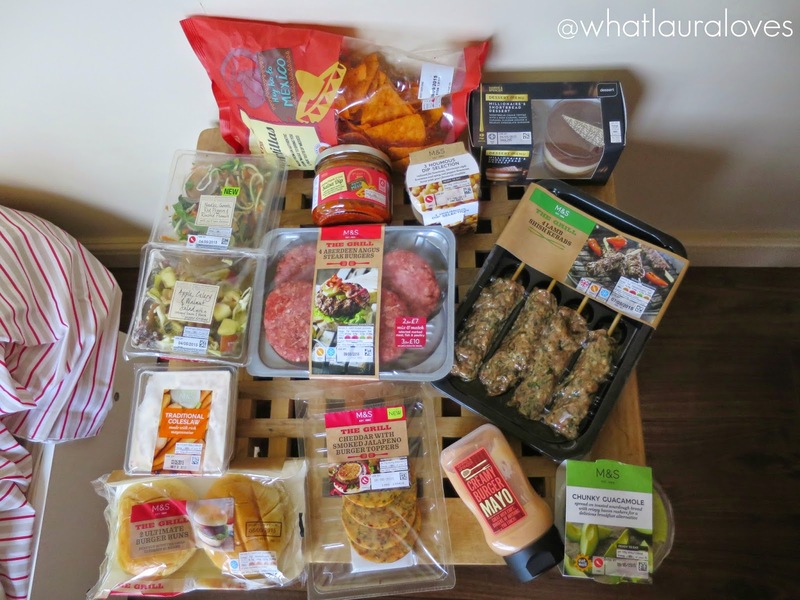 We stopped at M&S en route to pick up lots of BBQ food that we knew would be easy to make while we were there as neither of us had cooked on a fire pit before. When booking to stay at the Bells of Hemscott, you’re emailed with full directions and instructions for getting to the site and lots of information about your accommodation so we knew what extras we needed to take with us. Finding the site was really straightforward, we simply followed our sat nav which took us straight there. However we did veer off the route slightly when we saw an ice cream parlour sign posted that is well worth a visit. The site is situated right next to the beach, you literally walk over or in between some sand dunes and you’re there. It is set back from the road too, although the site is clearly visible from the road so you know exactly where it is as soon as you see it. 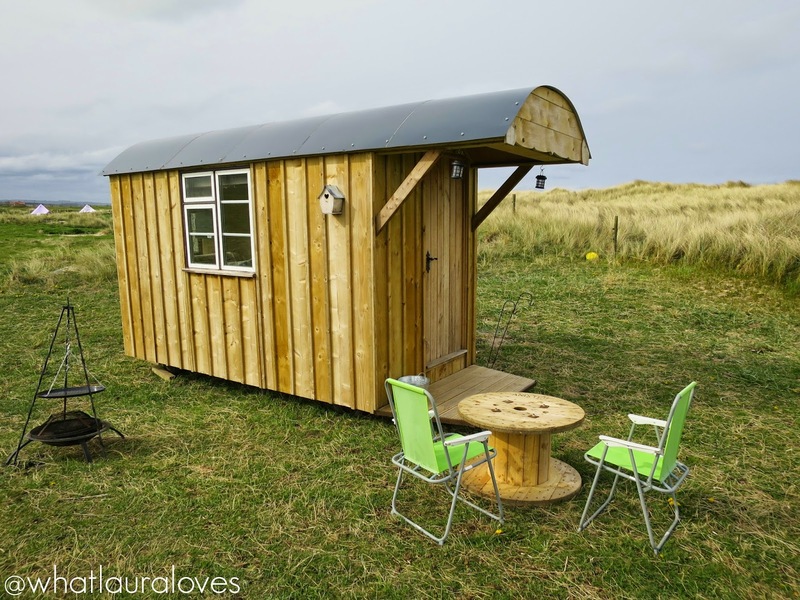 The gate to the site was locked when we arrived and after a quick phone call to the friendly owner, Alison, as detailed in the booking email, we were directed to a place to park, a minutes walk away from the Shepherds Hut. We instantly loved the look of the Shepherds Hut and the glamping site as a whole; very quaint and peaceful but right next to the beach. I can only imagine how fabulous this would be in warmer weather as it was very windy by the time we arrived. Alison showed us where everything was, including the excellent hot eco style showers and the portaloo facilities that were only a short walk away from the hut, and gave us our fire lighting kit which included everything that we needed to light the fire pit for warmth and to cook on. We quickly settled into the Shepherds Hut and made ourselves at home. It has everything that you would need for a rustic, night away from home including a little area for preparing food equipped with everything that you would need (crockery, cutlery, knives, serving dishes etc), sitting to eat and a sofa that converts into a comfortable double bed. Bedding and sheets are provided along with pillows but as we knew the weather would be cold, we took extras with us which we were very grateful for come the evening when things started to get a little chilly to say the least. The cold didn’t dampen our spirits though as we knew it wouldn’t be scorching temperatures and dressed accordingly, even though we did look a little silly from time to time! Cooking on the fire pit was surprisingly straight forward and it didn’t take long to light at all which was definitely a vast improvement on the 3 hours it took us to light the log fire in the country cottage we stayed at a few years ago! (OH THE SHAME!). By the time our food was ready, it had started to get dark outside and it felt so idyllic to sit inside our little hut with lots of tea lights lit around us, sipping on our Kir Royale style drinks and enjoying our feast. If the weather were in our favour, we may have preferred to enjoy our dinner on the table and chairs outside but given the wind, inside the cosy Shepherds Hut was a much more appropriate setting for dinner. The Bells of Hemscott provide lots of tea lights in tea light holders for you to light around the Shepherds Hut as well as a string of fair lights and a battery operated lantern that I found particularly useful for lighting the way to the washroom when it was dark. That’s the beautiful thing about being out in the countryside, right next to the coastline; it gets so dark at night and the stars are so bright in the sky. As we were visiting the weekend before our first wedding anniversary, it felt quite romantic and being switched off from the outside world with very little 3G access, as it really gave us the opportunity to talk and have a laugh without the interruption of social media and electricity in general. For the record, I am the champion at both Snap and 21 when it comes to playing cards! There are ample facilities for washing up dishes, etc at the back of the Shepherds Hut which we really appreciated as it meant that we didn’t need to walk very far with our dirty dishes. Before we turned in for the night, we took a walk along the beach which is literally seconds away from the Shepherds Hut. 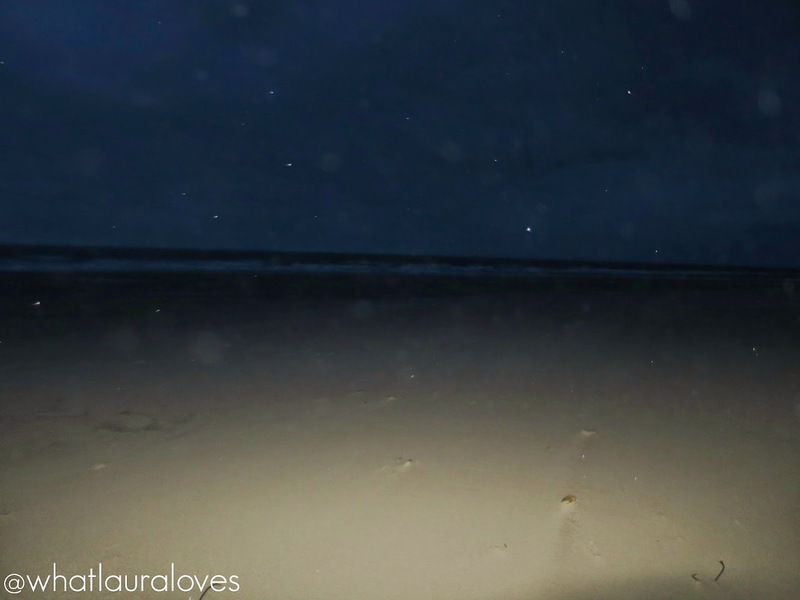 We timed this well as shortly after the heavens opened but the time that we did spend on the beach was lovely. Some of beaches in the North East are simply stunning and this is definitely one of them. Its so clean, clear and peaceful, making it great to walk along. Who needs to travel abroad when they can have a beachside staycation right here in the UK? Setting up the sofa bed was relatively quick and easy once we worked out how to navigate it. The sofa bed itself wasn’t an issue but as you couldn’t really stand either side of the bed, it was easier if one of us put it up rather than both of us. All of the bedding was fresh and clean and took minutes to put on the duvet and pillows. 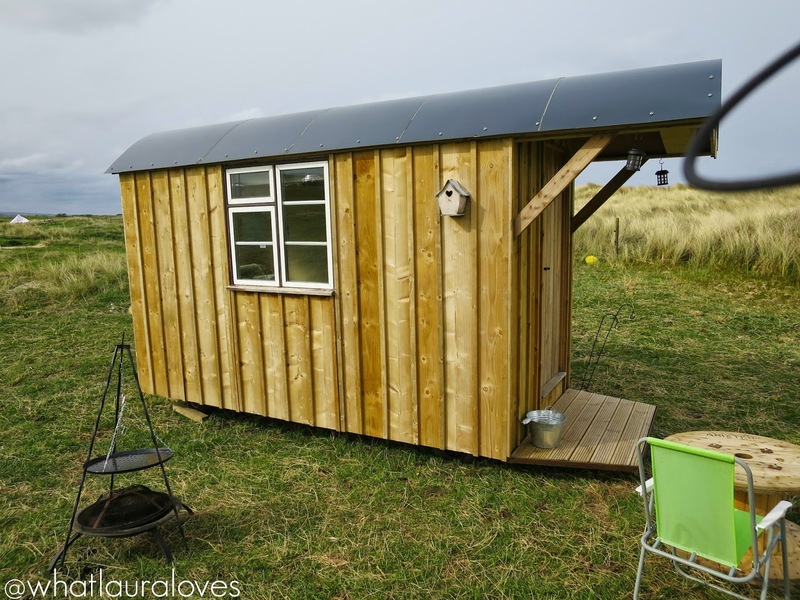 We loved listening to the rain pitter pattering on the roof of the Shepherds Hut as we drifted off to sleep and I must say that we had a very comfortable nights sleep, waking up feeling refreshed and ready for the day. There is so much to do in the neighbouring towns around the glamping site. We went out for Sunday lunch the day after our night at the Shepherds Hut and enjoyed a delicious meal at the Joiners Arms. 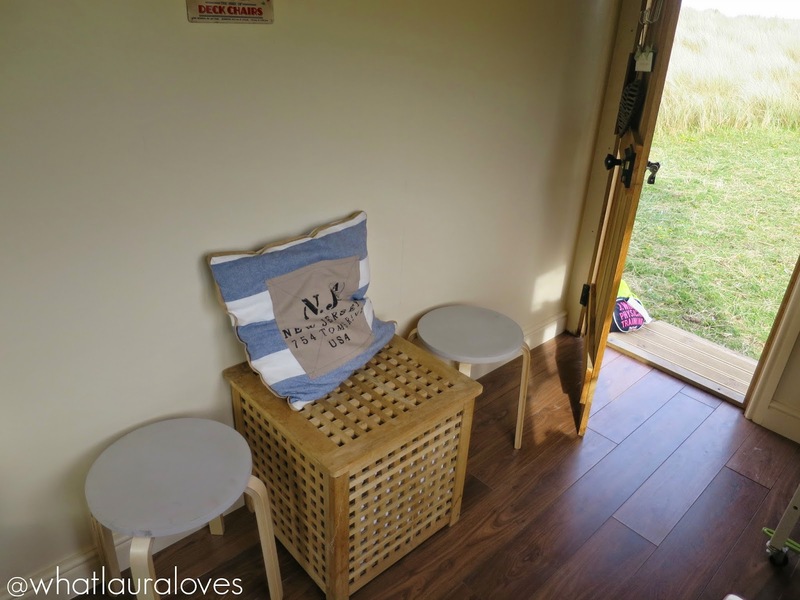 We thoroughly enjoyed our stay at the Shepherds Hut and would definitely recommend staying at the Bells of Hemscott if you’re looking for a night away in Northumberland where the countryside meets the sea. To find out more about the Shepherds Hut at the Bells of Hemscott and to book, click here. Wow this looks lovely, and so idyllic. 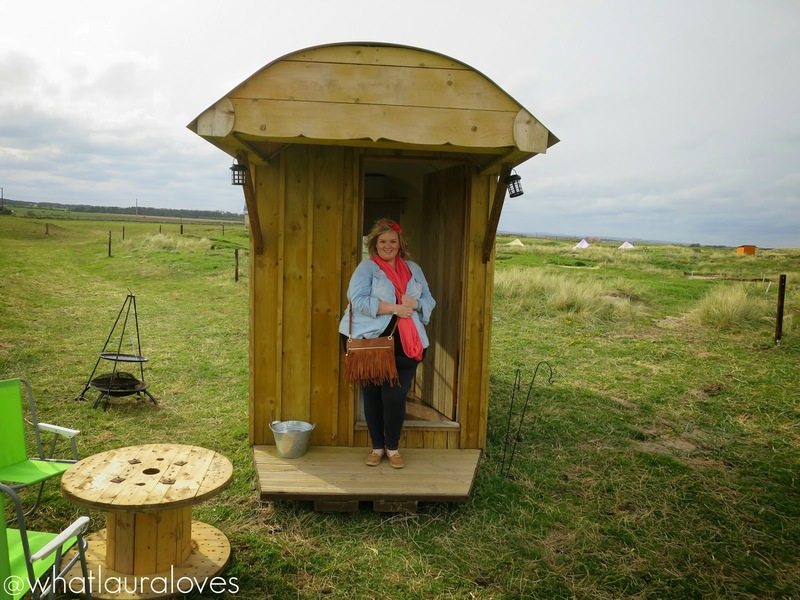 I went glamping at the weekend and actually loved it. I would never thought inside would be this big. I would love to try something like this. It look likes you had a lot of fun. Oh my gosh, I LOVE tiny houses so I am so jealous. My dream is to live in one, one day. I didn't even think about the idea of just staying in one for a few nights to try it out. Hahah glamping, love it!